Just five days after the signing of the Voting Rights Act of 1965, the Watts Rebellion erupted lasting several days. Coming out of the Selma campaign, the-then United States Democratic President Lyndon B. Johnson was forced to introduce legislation designed to ensure the right to the franchise for African Americans living in the South and other regions of the country. Nonetheless, the Civil Rights Act of 1964 and the subsequent Voting Rights legislation the following year was not nearly enough to assuage the African American people in their quest for full equality and self-determination. Unemployment, poverty, racist violence and substandard education fueled the anger of working class and poor youth throughout the urban and rural areas of the U.S.
As early as May 11, 1963 in Birmingham, an often forgotten rebellion occurred in the midst of the largely nonviolent struggle to break down legalized segregation. In 1964, a series of violent outbreaks occurred in the Kensington section of Philadelphia, Harlem New York, and several cities in New Jersey. Malcolm X, El-Hajj Malik El-Shabazz, broke with the Nation of Islam in March 1964 and later formed the Organization of Afro-American Unity (OAAU) calling for a revolutionary organization urging self-defense against racist violence and international solidarity with the African and Middle Eastern independence movements and progressive governments. Contributing to the loss of faith in the Democratic Party, the Mississippi Freedom Democratic Party (MFDP), an independent organization which challenged the seating of the racist Democratic Party delegates at the national convention that year in Atlantic City, was refused recognition despite its mobilization and organization of tens of thousands of African American workers, youth and farmers throughout that racist state. Mrs. Fannie Lou Hamer, vice-chair of the MFDP, delivered an impassioned plea to the credentials committee of the Democratic national convention documenting the horrors under which the African American people of Mississippi were living under in 1964. However, the Johnson administration utilizing Minnesota Senator Hubert Humphrey who became his running mate and the-then Minnesota Attorney General Walter Mondale sought to convince the MFDP to accept two seats at-large on the promise that segregated party delegations would not be allowed at the next convention in 1968. The compromise was rejected by the MFDP although Johnson went on to win the presidential elections against Barry Goldwater by a landslide that November. On August 11 the rebellion in Los Angeles was sparked by police harassment of an African American motorist and his family. Underlying the rebellion was the continuing national oppression and the failure of Civil Rights laws to ensure full political and economic rights to the Black masses. This rebellion was ignited by a very common incident on August 11, 1965 when Marquette Frye, an African American youth and his brother, was stopped and later arrested by Lee W. Minikus, a white California Highway Patrolman. Minikus said that Frye was suspected of being under the influence of alcohol and resisted arrest. Soon his mother came on the scene and moved in to protect her sons who were being accosted by the cops. In a matter of minutes a crowd of people gathered at the scene of Frye’s arrest on Avalon and 116th Street. The decades-long strained relations between police officers and the community exploded in a confrontation. 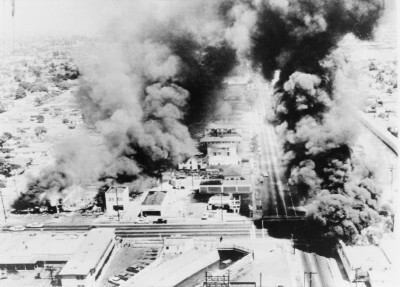 This skirmish prompted by Frye’s arrest soon spread throughout the area centered in the commercial district of Watts, which at the time was an extremely impoverished African American area in South Central Los Angeles. During the course of the next week, tens of thousands of people took to the streets overturning and burning automobiles, liberating and destroying supermarkets, liquor stores, retail outlets, and pawnshops. A week-long rebellion in Los Angeles required over 14,000 California National Guard troops mobilized across a curfew zone covering forty-five miles to restore stability. The rebellion resulted in the loss of thirty-four lives, and more than one thousand reported injuries. Nonetheless, the McCone study, commissioned by California Governor Pat Brown, discovered what the African American community had known for years: that the rebellion was the direct outcome of the people’s subjection to high unemployment rates, substandard housing, and inadequate schools. Despite the McCone Commission study’s findings following the rebellion, municipal and state officials systematically refused to reform police-community relations as well as create the conditions for the social and economic advancement of African Americans living in the Watts area. The Watts Rebellion was the largest of such an outbreak led by African Americans up until that time. Watts was followed by hundreds of other rebellions taking place during the years of 1965-1970 throughout the U.S. In 1966, Black Power became the rallying cry of millions stemming from the “March Against Fear” through Mississippi in June of that year. Organizers for the Student Nonviolent Coordinating Committee (SNCC) such as Stokely Carmichael (later known as Kwame Ture), H. Rap Brown (later Jamil Abdullah al-Amin) and Willie Ricks (Mukassa Dada) placed greater emphasis on self-determination, Black Nationalism and Pan-Africanism. Thousands of African Americans were elected to public office and millions entered higher educational institutions and employment categories where they had been previously excluded. Nonetheless, the fundamental problems of racial capitalism and national oppression remained entrenched. When the world economic system began a massive restructuring during the mid-to-late 1970s, many of the gains won through the Civil Rights, Black Power and Women’s Movements were eroded. By the first decade of the 21st Century affirmative action programs were outlawed in various states throughout the U.S. The downsizing of educational and public systems of governance disproportionately impacted the oppressed communities since it was in these sectors of the economy that the most profound advances had been made. Out of these rebellions came an emphasis on revolutionary politics, armed struggle and self-determination. It was only after the urban rebellions that any serious movement towards affirmative action, electoral reform and community control were enacted. Today urban rebellion remains a key element in the struggle of the African American people against national oppression and economic exploitation. Since 2012, with the vigilante killing of Trevon Martin and the resultant acquittal of George Zimmerman, a rising consciousness and intolerance for racism has been rapidly accelerating. When 18-year-old Michael Brown was gunned down by Darren Wilson on August 9, 2014, a rebellion erupted in Ferguson, Missouri, prompting mass demonstrations throughout the U.S. and around the world. Another rebellion in Baltimore during late April of this year, further illustrated the reemerging militant character of the African American people. These rebellions and demonstrations must be organized into an independent revolutionary movement. The U.S. capitalist system fundamentally has nothing to offer oppressed youth in the way of jobs, economic opportunities, quality education and decent housing. The plight of African Americans and other oppressed nations have not been addressed at all by the current administration of President Barack Obama. Presidential candidates for the Democratic and Republican nominations are conveniently sidestepping the question of the national oppression of the people of color communities. Such a political atmosphere provides vast avenues of opportunity for a revolutionary movement to organize these constituencies in opposition to the ruling class. The unrest in Ferguson surrounding the first anniversary of the killing of Michael Brown illustrates that people are ready to fight and only needs the effective organization to give expression to their social and political aspirations.